The draft horses names are Melody, Valerie, Annie and Modean. The feeder is everything you said it would be. Glad we made this purchase. Fence Line Hay Feeder – I scanned the internet for MANY HOURS trying to find a fence line feeder that made sense for our small cow/calf operation. 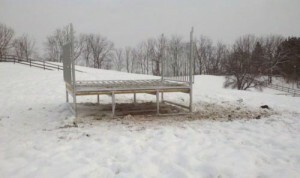 The ability to load feeder from outside paddock or pasture to avoid winter ruts. 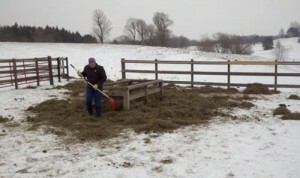 Ability to cover feeding area to keep hay & feeding area dry. When I came across the image of the BK-12 outside your shop, I was immediately drawn to its main design features; hay saving trough, offset cattle feed openings so cattle don’t pull hay out of feeder, sloped bale area to move hay towards feeding trough, etc. I’ve only used the feeder for a few weeks, but I am confident of the hay saving features. A good friend helped assemble the unit, which took the two of us roughly 90 minutes. This included, time spent unloading from the truck, organizing the different (well marked) parts, looking at the assembly manual & putting the unit together. My friend who is a farmer/welder/fabricator & mechanic was surprised at the high quality and close tolerances of the fabricated pieces. Both of us were more than a bit surprised that EVERY bolt flawlessly fit each attachment point without any extra effort. 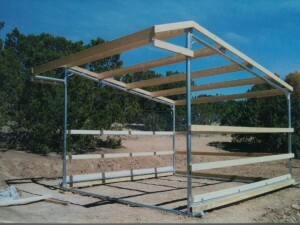 The following day we clad the pipe structure with treated lumber & slick marine grade plywood. We noticed that there were more than enough welded tabs & attachment points to anchor our wood any way we desired. 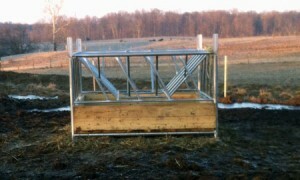 The structure is designed with attachment points to add a roof structure to keep hay dry. We decided to build a larger covering over our unit, but got the idea of coving it from Klene. Since I live roughly 60 miles from Klene, I decided to pick my order up a their facility. This allowed me to see firsthand the quality of some of the other structures. They are all “First Rate”. We have already been talking up our fence line feeder & showing it off to friends, so plan on hiring a few more fabricators to keep up with demand. 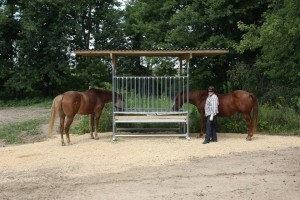 Klene Pipe Structures manufactured and delivered a fantastic horse feeder. Our draft horses are able to free feed and access hay at a rate we can control. It’s easy to load, stays dry, limits waste and saves money. This is a great solution for round bale feeding. Thank you Kevin. I have two H-8 feeders I built roofs onto. They are as close to a zero-waste feeder you’re ever going to find. We used to feed our horses standing 1000 lb. round bales on end on the ground. Generally got 10 to twelve days a bale on two horses, depending on weather. Enormous waste tramped up, spread around and messed on. Now we get 10 to 14 days on FOUR horses (per bale, per feeder, depending on temperature – they eat more in winter), and are able to control healthy weights on them. It is important to close these feeders for several hours every day. We close them all but six hours a day. Then the horses get busy eating what they have just dropped on the ground. By morning when we open ours again, they have eaten all the droppage, resulting in virtually zero hay waste. You let the horses eat down to and clean the plank floor before re-baling. Also, the tops of five foot bales can sometimes get pinched between the top ends of the fall gates early in each bale cycle, and it is sometimes necessary to pull the top few inches or so off the tops of the bale with a weed rake for a couple days each cycle when this pinching happens. These feeders are not cheap, but I can already see that we will make the expense back in waste reduction in under two years. Moreover, they give the horse owner a very effective, clean way to feed horses in a controlled manner to keep their weights healthy. Highly recommended. Contact me with questions if you like. We bought this feeder a week ago. And I’ve got to say this is the best feeder you could buy. Some might think it’s a little pricey but “you get what you pay for”. The quality in construction is next to none. We bought a number of different kind of round feeders and wasted a lot of money because they were made for cows and modified for horses. This is made for horses. It only took 4 hours to assemble the feeder with two people. 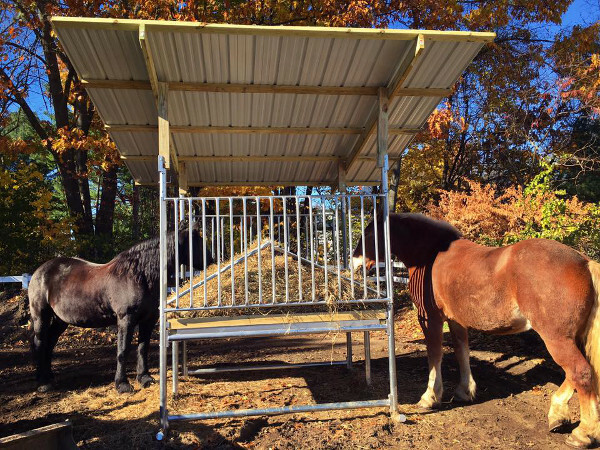 If you’re looking for a feeder for horses, this is the one. They were eating out of it as soon as we put it in the field. Five out of Five stars!!! I keep great records on my hay feeding each year. For the group of 22 cows I have in the lot where I placed the feeder I purchased from you I saw a measureable and immediate improvement in the hay conversion. I was feeding one 1,600 pound round bale of hay per day prior to your Hay Saver feeder being purchased. In the first two weeks I fed 11 bales during that time period. That’s over a 20% savings for me. This feeder really does save hay! No waste around the hay feeder. This is also going to really change how often I have to haul manure from the cement pad as well. 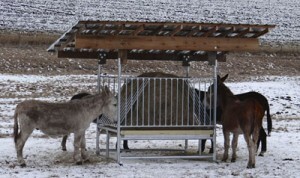 Before with my old hay feeder there was a large “hay mat” that circled the feeder. Now I have virtually clean cement around the feeder after several weeks of feeding. Great Product. I LOVE these feeders! I can’t explain how much easier life is with these things! I searched and searched the internet a few years ago for an alternative to square bales. Alabama’s heat is unbearable. SO hard to put up hay in that situation. It was an investment but in the long run there are MANY reasons to invest in these feeders. #1 – Tractors do all the work. No more handling hay with danger of getting heat stroke, etc. #2 – Saves money in two ways – don’t have to pay hired help and round bales are less expensive to have harvested (we own our own hay land). #3 – When they’re out of hay, you get the tractor out, get a bale of hay, stick it in the feeder and you’re done for almost two weeks (in our case). I’m figuring 4 round bales per month. We have two of these feeders for two paddocks with three horses in each paddock. One other thing I’m thrilled about is how easy the feeders are to move. We have had BUNCHES of rain in the last couple of weeks. Hook a chain to it from the tractor and haul it off to a dry and clean spot because they have runners like skis. Also, they survived two LARGE tornados! Glad they had just been filled with hay! I am SO happy with the feeders, thank you Klene Pipe! 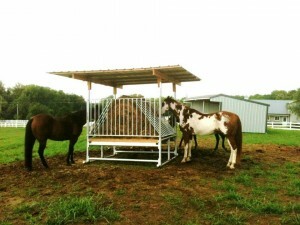 I highly recommend the H-8 hay feeder for horses. I’ve had my feeder for 4 weeks. In that time I have saved one whole round bale. Previously I was getting 4 to 5 days out of a bale on the ground and now I’m getting 6-7 days per bale. The safety of the horses has been important in my consideration of a hay feeder because I run a team of Percherons with 3 Arabian saddle horses. This feeder is everything it is advertised to be on this website, efficient, safe, easy to load and clean up and well built. As well, the service provided me in ordering and delivery was outstanding. The Wrangler Horse Run-In metal frame kit you sold us was a very smart purchase. Construction of the steel pipe frame was a snap using the initial help provided by my wife in steadying several of the pipe pieces while I bolted them together. With good lumber in hand, completion of the Wrangler frame went smoothly and was truly a one-person job. I had the local Muller metal building store supply the 26 gauge steel trim and paneling needed, along with much heavier gauge steel L-shaped molding that I placed atop the 3/4 inch plywood kick panels and framing to prevent horse chewing. To increase brightness inside the Wrangler Run-In (horses prefer bright areas), I had a frosted fiberglass panel installed near the center portion of the roof. 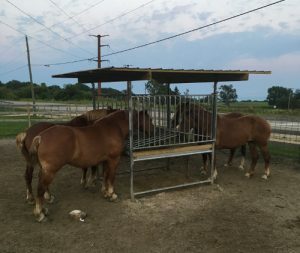 Our two horses love their new Wrangler Run-In shelter, and always enter it whenever the wind picks-up, or during a rainstorm. 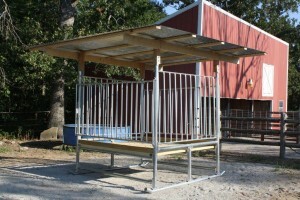 In summary, my wife and I are very pleased and satisfied with the Wrangler metal frame kit we purchased from Klene Pipe Structures and totally recommend it to anyone needing a strong, well-engineered, and good looking horse run-in. 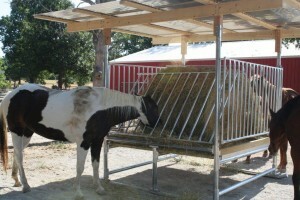 The Southern Utah University Equine Program purchased four Klene Pipe Big Bale Feeders, and have been using them for the past year to feed our horses. 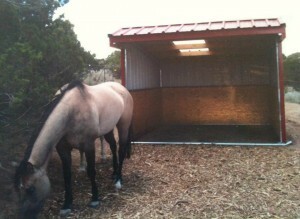 The feeders have simplified our feeding schedule and reduced the labor required to feed our horses each day. Once the horses get used to the feeders, they do a good job self-regulating feed intake, and we are very pleased that horses can eat anytime they want to. It has made it possible to run bigger groups together because the horses have access to feed all the time and animals lower in the pecking order can eat without being driven off. 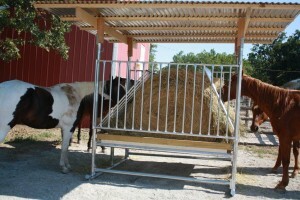 The feeders are well made, and hold up to the pressure that comes from feeding herds of large animals. We are very pleased with the performance of the feeders and the results we have seen. We plan to buy additional feeders as needed in the future. Thank you for making such a great product! View pictures of this customer’s building. Thank you for a great product! 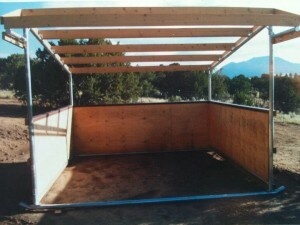 I was able to customize a barn to fit my personal needs. Your firm was great to work with. I built this barn by myself with minimal help. Everyone that visits my farm loves my barn. It has electricity and water. 34×36 in size. 4 12×12 stalls, 1 12×10 and 1 12×10 tack room. First of all, let me say thank-you for a wonderful building. I was pleasantly surprised by the ease of the whole building process. You couldn’t have said it more perfectly when you said, “It’s like putting together an adult erector set.” I’ll defiantly order my next building from you guys. Klene Pipe Structures, I am returning the video you sent when I ordered my building. It was very helpful. I was happy with the ease with which the pipe frame went together and came out square. I also liked the minimum waste of standard length materials that I purchased locally. I’m using the shed for small equipment storage at this time. Perhaps in the future I’ll build an addition or will need a cattle shelter. The building went up easily, the video was a big help! My daughter and I built the frame in 1 1/2 hours and it took me about a day to get all the 2 x 4 boards hung. These times may seem long to you guys but you have to remember, I was working entirely by myself most of the time as we were harvesting crops. I am quite proud of my handiwork! All in all, it took my about five weeks, due to my work schedule, to get the barn done. We really like the barn. The building was no problem to install. I am very please with my shed. Just wanted to drop a note to tell you how much we love our 2 stall barn. We actually had fun putting it up and it is a great source of pride that we did the work ourselves. We plan on building another one next year. We can’t believe that everyone doesn’t have one. I just wanted to send you a note today & tell you how much I like the hay feeder that I got from your company last fall. It is the best thing since eggs & ham. It is easy to load from the end gate and it saves all of the fallen leaves, the cattle clean them up very well. I have had some farmers stop & inspect it, & inquired where I got it and my ideas. Again, I say thanks for a good product. I am glad I saw you at the state fair. Enclosed is a picture of it, snow on roof, not on the hay. As manager of Michigan State Universities Horse Teaching and Research Center I am often asked to try new products. 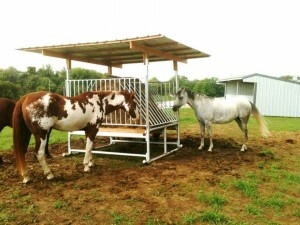 When Klene Pipe Structure asked me to comment on their new hay feeder the H-8, I was happy to do so. I found the H-8 to be one of the most attractive hay feeders on the market. It not only looks nice it helps reduce hay waste thus saving money. 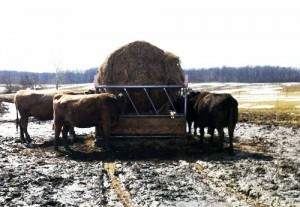 Filling the feeder is very easy for both small round bales and square bales. I have been happy with the H-8 feeder by Klene Pipe Structures.